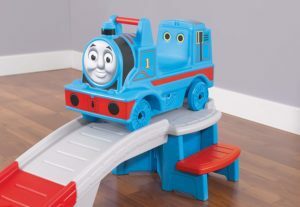 Step2 Thomas the Tank Engine Up and Down Roller Coaster is now available at Amazon.com for just $89.87 (REG $169.99) (As of 23 March 2019, 16:24 PST – Details) with $80.12 (47%) Savings. Children can easily access this kid’s coaster by using the non-slip steps on both sides of the track;Gender: Unisex. Roller coaster car features a high seat back, coaster hand-rail and foot rests for a secure coaster ride. Kids ride on playset features over nine feet of roller coaster track for endless hours of coaster ride-on fun. Recessed wheel wells hold the kid’s coaster ride on car in place until your little one is ready to roll down the track. 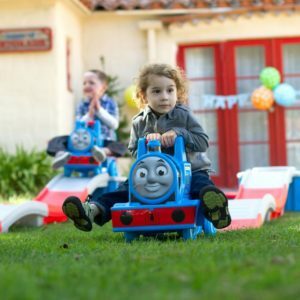 Kids will love to ride the rails with the Thomas the Tank Engine Up & Down Coaster. Children can climb up the steps and take a ride down the coaster for fun that creates a smile every time. Kids can access the coaster car from both sides with the coaster steps. The fully assembled car has a high back, handrail and two foot rests for a secure and fun ride down the track. The car also has the adorable face of Thomas the Tank Engine. Recessed wheel wells hold the coaster car in place until kids are ready to push off and roll down the track. With over nine feet of track, the fun is endless. Made in USA. 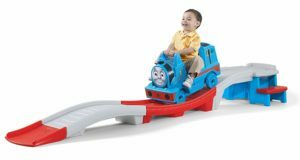 All aboard the Thomas the Tank Engine Up & Down Coaster! Step2 has taken the classic Up & Down Coaster and transformed it into the character Thomas the Tank Engine. This friendly and fun coaster can go inside a playroom or outside the yard. Toddlers and children will develop their balance and coordination as they climb, ride, and push off for a fun and amazing ride on their favorite friendly character. Over nine feet of up and down track – Roller coaster track dimensions: 12.75’H 110’W 27’D – Coaster dimensions: 16.25′ H 25.13′ W 12.5′ D – Maximum Weight: 50 lbs (22.7 kg) – Adult assembly required – Recommended age: 2 to 5. This adorable coaster car features a comfortable high back, a handrail and two foot rests for a fun and secure ride. Kids will love to see their favorite character they can ride on. Toddlers and kids can access the coaster car from both sides due to the two steps at the back of the coaster. Coaster car is sturdy and snug in the wheel wells until kids push off with their feet to ride down the track. This will be a hit with your little ones. The coaster car provides a fun ride and keeps kids active. Children will line up for their turn on this amazing Thomas the Tank Engine roller coaster. Easy to assemble, easy to keep clean and store. Toddlers and kids will love this durable fun and easy to set up coaster. 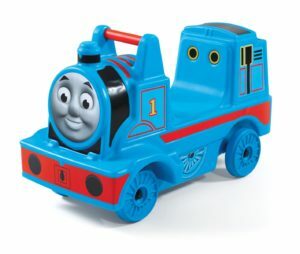 Detailed Thomas the Tank Engine with authentic face, decals and color is a must have for any little Thomas Fan. 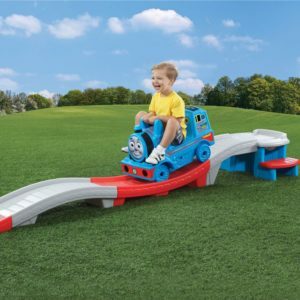 Kids will love to ride the rails with the Thomas the Tank Engine Up & Down Coaster. Children can climb up the steps and take a ride down the coaster for fun that creates a smile every time. Kids can access the coaster car from both sides with the coaster steps. The fully assembled car has a high back, handrail and two foot rests for a secure and fun ride down the track. The car also has the adorable face of Thomas the Tank Engine. Recessed wheel wells hold the coaster car in place until kids are ready to push off and roll down the track. With over nine feet of track, the fun is endless. Made in USA. Over nine feet of up and down track – Roller coaster track dimensions: 12.75’H 110’W 27’D – Coaster dimensions: 16.25′ H 25.13′ W 12.5′ D – Maximum Weight: 50 lbs (22.7 kg) – Adult assembly required – Recommended age: 2 to 5.